It has been a while since we have discussed the topic of publishing your source code, and the issue of reproducibility in numerical simulations. I thought it be insightful to consider an example where we try to reproduce published results using QuTiP. Here we will try to reproduce Figure #1 from Qian et. 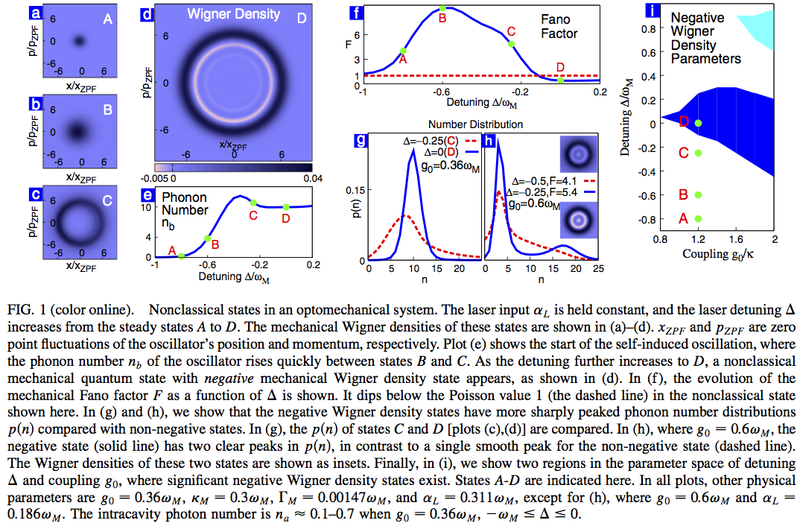 al., "Quantum Signatures of the Optomechanical Instability", Phys. Rev. Lett. 109, 253601 (2012). This is an ideal example for several reasons: I) It is an interesting topic. II) This paper relies almost entirely on numerical results to support their conclusion. III) It is a perfect project for applying QuTiP. First of all yes, it does not look as good, but hey, I am also not submitting it to PRL. Second, you will notice that the subfigure on the far right looks a bit different from the results in the original PRL figure. In particular, there is an extra region of stability near Delta/wm=1 for lower coupling strengths, and the graph is quite "blocky" compared to the smooth regions presented by the original authors. Why this is the case will be the focus of the discussion that follows. where c_op_list is the list of collapse operators, and rho_ss is the steady state density matrix. To generate subplots (a)-(h), all we need to do is calculate this steady-state for each value of detuning and coupling strength given in the paper. Things like the Fano factor (part f) and Wigner functions can be calculated directly from this state. The most difficult part to reproduce was part (i) from the figure. To generate this figure, I initially broke up the region of interest, detuning from -1 to +1 and coupling from g0/kappa=0.8 to 1.2, into a grid of points and calculated the Wigner function at each of these locations. From these Wigner functions, we can extract the minimum value, and the ratio of  the number of negative Wigner values to number of positive values. These two numbers give the criteria for non-classicality used in the paper. 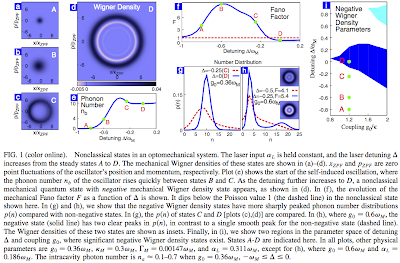 Per their definition, for a state to be nonclassical, the magnitude of the minimal Wigner value should greater than 5% of the maximum Wigner value, and the number of negative Wigner elements should be >= 3% of the number of positive elements. The first of these criteria is a valid numerical benchmark, however physically, having just one point that is negative doesn't mean much for the entire state. Therefore, the authors supplemented this with the much more physically relevant condition that the total negative Wigner area should be an appreciable part of the total. The problem is that, as it stands, this criteria is subject to numerical errors. This is because values that should be identically zero, sometimes pickup small positive or negative components at the end of a numerical calculation. Therefore little values such at +/- 1e-15 can distort the ratio of negative to positive Wigner terms. To get around this, I set a threshold of tol=1e-8 such that any Wigner value  -1e-8 <= w <= +1e-8 is set to zero. This is quite a liberal bound for numerical errors but works none the less. After setting up the calculation, the results did not agree with those of the original paper. After contacting the lead author, I found out why. First, in generating part (i), the authors change the power of the input drive called alpha_L. However, in the caption of the figure, and the text of the paper, the authors say this parameter is fixed. Therefore, the reader would have no idea that they vary this parameter. Furthermore, the equation that they use to vary the laser power is not in the paper, nor in the supplementary material. The authors plan to fix this in an errata. In addition, the authors do not worry about the numerical errors from small non-zero terms. To generate part (i) the authors calculated the states at several points and then, by eye, determined whether they satisfy the non-classicallty constrains. Subfigure (i) plots the boundaries of the regions found via this method. Having fixed our simulation to account for the changing input power alpha_L, to obtain sufficiently similar results to the original paper, it was found that our tolerance value for zeros must be set to tol=1e-4. This is equivalent to saying that, in an experiment, one can only measure values with magnitude greater than this threshold. The final result is presented in the QuTiP generated figure above. The final thing to consider is the extra region on non-classicality near Delta/wm=+1. It could be that the authors missed this section using their search method. An indeed, using their parameters this seems to be the case. However, this extra region of non-classicallty is actually a numerical artifact resulting from not considering enough basis states for the cavity resonator at these larger driving powers (again this fact is missing in the paper). Increasing the number of basis states to Nc=8 and Nm=60 makes this region disappear. What is the end message? Well, what originally was planned to be a single days worth of calculations turned out to be a weeks worth of emailing with the authors and adjusting parameters to try to reproduce their results. Had they included their source code with the paper, this could have been avoided. The author stated that they did not have any room to discuss computational details in the manuscript, however I find this answer pretty weak given that PRL has supplementary material, which the authors used, made explicitly for details such as these. After discussing with the authors, I now understand what they were trying to show with their calculations, and was actually quite impressed with the knowledge of the main author with respect to numerical simulations. Unfortunately, a lot of this didn't come through in the paper. Hopefully when the errata get published this will all become clear. Qian et. al. PRL 109, 253601 (2012). script that plots all of Figure #1. This file MUST BE run first. tol=1e-4                #sets limit for what is considered zero (measureable). in the original PRL Figure. #of non-classicality of the mechanical resonator.